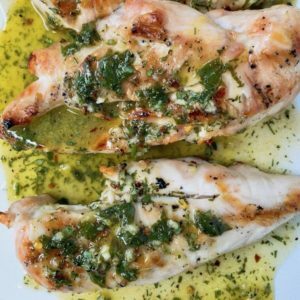 This recipe for Juicy Grilled Lemon Herb Chicken Breasts may surprise you as the chicken isn’t marinaded, rather simply grilled with the most incredible lemon herb dressing poured on top. Brining is the secret for juicy chicken breasts. Want to know another secret? Brining boneless chicken breasts doesn’t require lots of time. Thirty minutes is all you need for juicy breasts. I’m talking chicken here! This recipe came about by accident. I needed to make supper and wanted lemon chicken but there was no time for marinating. I had an assortment of fresh herbs, lemons, garlic, and great olive oil. I figured I would simply grill the chicken and make a fresh sauce to pour on top. Grilling chicken breasts often result in dry chewy meat. Some people pound the breasts to an equal thickness to cook them evenly and avoid overcooking. I don’t like to pound meat if I don’t have to. I mean it’s cruel and unusual punishment. Instead, I choose to either brine or slice the chicken breast in half horizontally for a quicker and more even cooking. For this recipe, brining is my choice since it only requires 30 minutes. By the time I chop, mix everything together, and heat the grill, I’m ready to roll. 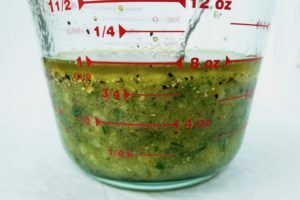 For the dressing you will need cilantro, dill, and parsley. Don’t like one of these herbs? No problem. Use one, two, or a combination of whichever you like. If I have fresh lemons in the fridge, then I’ll use the zest and juice of two lemons. Don’t judge, but if I don’t have fresh lemons, I’ll skip the zest and use good quality bottled lemon juice. For for the best flavor, use lemons and zest. If not, bottled juice and no zest will do. 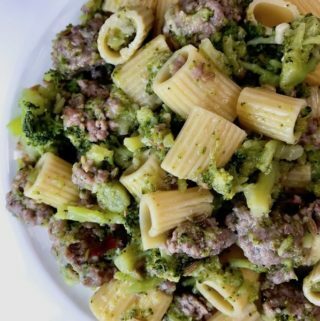 You do need to use freshly minced garlic. Use a good garlic press (affiliate link) or chop until finely minced. After bring the chicken, remove chicken from brine and grill. 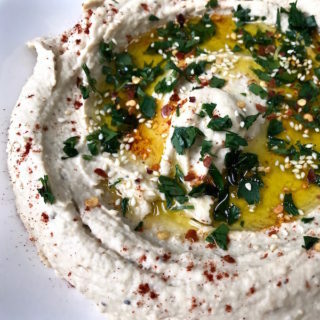 When done, transfer onto a serving platter and pour the fresh lemony herb dressing all over. 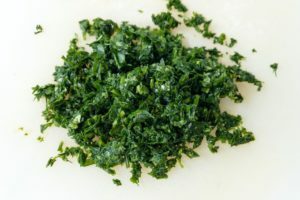 You’ll see chopped bright green herbs, minced garlic, and crushed pepper coat the chicken breasts beautifully. Turn the chicken breasts and drizzle some more dressing. The dressing will sink into the nooks and crannies of the underside. Omg. Roasted Chicken Leg Quarters – super easy and I made it using one arm when the other was in a sling! Slow Roasted Chicken – just put it in the oven and forget about it! Italian Chicken Cutlets – crispy, crunchy, and super delicious! Serve this Grilled Lemon Herb Chicken with some of these delicious sides. You’re welcome. Now, start your grills. 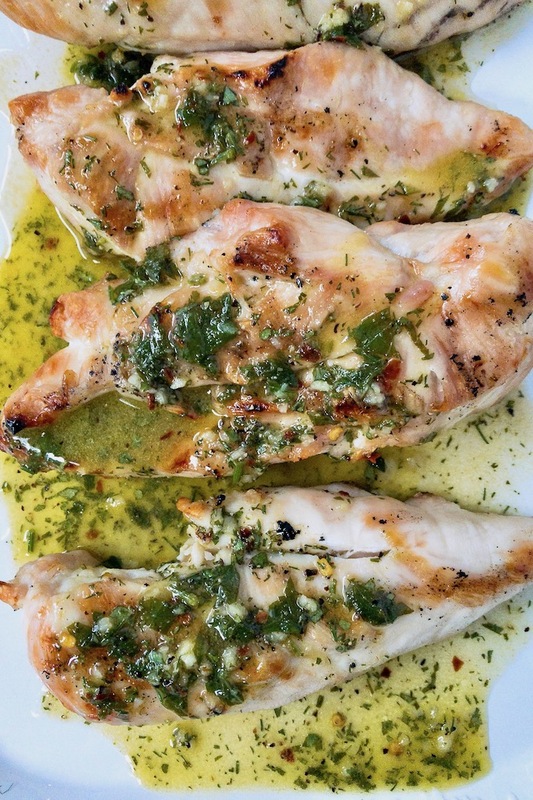 Chicken breasts brined for 30 minutes, grilled, then drizzled with a fresh lemony herb dressing delivering incredible flavor. 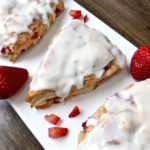 Quick and simple to make. 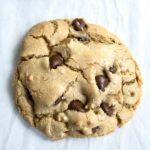 Another K.I.S.S - keep it short simple recipe. Don't have a grill? See the Notes section for broiling instructions. 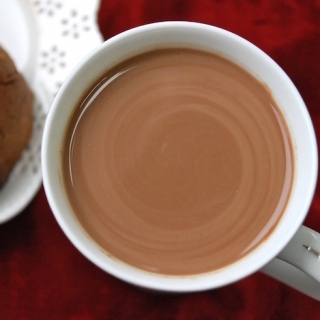 Dissolve 6 tablespoons kosher salt in ½ hot water. When salt is dissolved, add 1 quart of cold water. 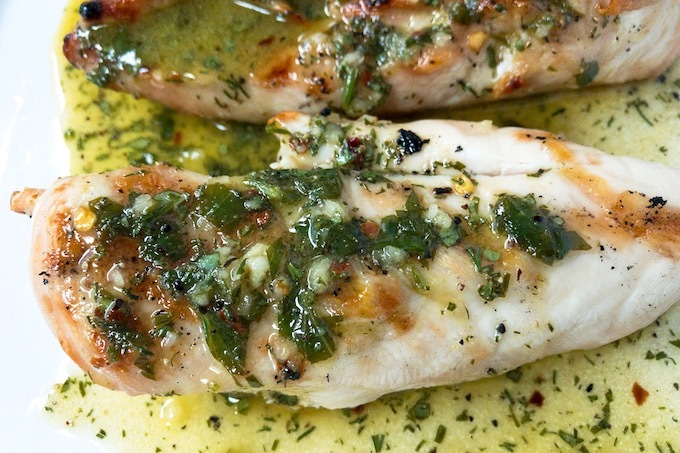 Brine the chicken breasts for at least ½ hour to an hour to ensure juicy results. 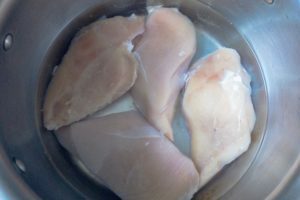 Don’t brine breasts for longer than 2 hours or the meat can become mushy. Combine all ingredients in a 2 cup measure and whisk with a fork until combined. Alternatively, you can combine everything in a bowl and use a whisk to emulsify. When ready to grill, remove breasts from brine, and place on oiled grates over medium high fire. Grill 5 - 7 minutes per side depending on thickness of chicken. When done, transfer onto a platter and pour dressing over chicken. You can reserve some on the side to pass around if you like. The herbs need to be fresh as dried will not deliver the same flavor. The garlic needs to be freshly minced for a burst of flavor. If you don’t have fresh lemons, skip the zest and use good quality bottled lemon juice. For for the best flavor, use lemons and zest. If you want to make the dressing ahead, mix all the ingredients and refrigerate for up to 2 days. To get the best flavor, make it fresh. You can use the broiler to cook your chicken. After brining, pat the chicken dry with some paper towels. 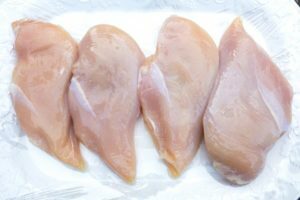 Place breasts onto a baking sheet. Place the oven rack on top rack about 4" down from the broiler. Broil for about 5 minutes per side depending on the thickness of the breasts.